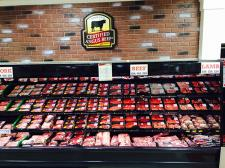 We have a wide selection of beef, pork, chicken, turkey and occasionally veal and lamb. Our fresh meat is cut right in store and is never injected with solutions, preservatives or color. We proudly sell Certified Angus Beef. Our sausage is made fresh in our meat department form only the freshest pork and seasonings. Stop by today to explore our great selection and unbeatable prices.